Diabetes patients in Northern Ireland are being denied access to essential equipment which would help control their condition. Three years ago, the department of health bought more than 1,000 insulin pumps costing over £2m. However, according to the local director for Diabetes UK, more than half of the pumps remain in "hospital cupboards". Iain Foster said it was a "public scandal" and a waste of money. "This has happened because individual health trusts have not created modern diabetes services which would ensure these pumps are issued to the people who would benefit from them," he said. "This is evidence of how disjointed our health service is." A diabetes specialist nurse said providing the automatic pumps was in line with national health care guidance. At a recent seminar in Belfast, Sally Friffina said there was a need for the NHS to make more of this therapy option for adults in Northern Ireland. "Proper care and modern treatment and technology can and does make a real difference to adults with Type 1 diabetes. The NHS and the government need to work towards making the treatment and technology available to all those Type 1 patients in line with the health care guidance. " More than 80,000 people in Northern Ireland live with the illness. In a statement to the BBC, the Department of Health spokesperson said : "NICE Technology Appraisal No 151 about the provision of insulin pumps, endorsed by DHSSPS in June 2009, applies to all HSC Trusts and significant progress has been made to implement it. "Trusts now provide insulin pumps to about 611 adults and children, but due to competing pressures for limited HSC funding there are waiting lists to start treatment." The Department of Health said insulin pump therapy was "not suitable" for everyone with Type 1 diabetes. "It requires diabetes education and support from specialist diabetes nurses or dieticians, and a high level of motivation from the patient," the spokesperson said. "The patient must be committed to monitoring a minimum of four times a day and be able to flexibly adjust their insulin therapy according to their blood sugars, diet and physical activity. "This is a higher daily level of commitment than multi-dose insulin regimes and patients who cannot maintain this level of commitment are at risk of suffering major and life-threatening complications. "The HSCB made £255,000 funding available in 2010/11 to start insulin pump therapy for 60 children and young people. In addition the CAWT (Co-operation and Working Together) cross-border diabetes project provided funding in 2011-12 for an additional 80 pumps for children. "A further £2.5m was allocated in the 2011/12 October monitoring round to purchase 1,100 new and replacement pumps. "These are expected to be phased in over approximately four years and will significantly reduce the time patients wait for this therapy. 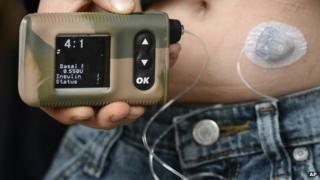 Insulin pumps cost around £2,750 and have a life-span of around 4 years." Diabetes UK said those with Type 1 diabetes must be better informed and equipped with the latest technology. The National Institute for Health and Care Excellence (NICE) said that 15% of the adult type 1 population should have access to insulin pump therapy. According to Diabetes UK, Northern Ireland has still some progress to make.